Sustainability expresses the ability of a system to remain productive indefinitely. It is often confused with the concept of sustainable development which focuses on how our current needs can be satisfied while ensuring the quality of life and needs of future generations through the restoration of existing damage to the ecosystem and the minimization of the impact of anthropogenic activities. In essence, these two concepts can be considered as the two sides of the same coin. Sustainability’s ultimate goal is sustaining life on Earth while sustainable development is related to the strategy for achieving that goal. By extension, both terms are directly related to the objectives of establishing and managing protected areas. 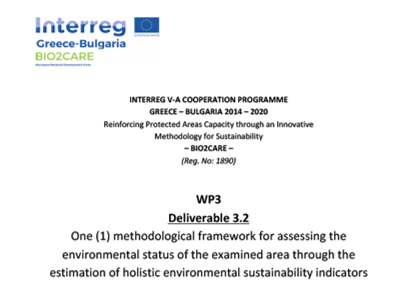 The aim of the specific study is to develop and present a methodological framework that will be able to assess the environmental status and sustainability of protected areas through the estimation of holistic environmental sustainability indicators. This report was produced in the context of WP3 / Activity 3.2. Disclaimer: The sole responsibility for the content of this publication lies with the authors. It does not necessarily reflect the opinion of the European Communities. The European Commission is not responsible for any use that may be made of the information contained therein.